I have been riding my bike to work lately instead of taking my car. I figured I could use the exercise. I figured it would be good for my health. I figured it might help stave off global warming. I figured wrong. I’ve noticed lately that the sky seems to get darker a little earlier every day. 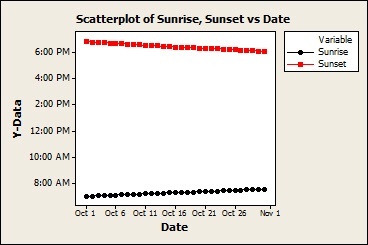 I asked my wife if she had noticed the same thing and she said, “When are going to take out that garbage like I asked?” I wasn’t sure I could tackle her garbage question, but I was reasonably confident that with the help of Minitab Statistical Software, I could get to the bottom of this darkness thing. I immediately created a scatterplot of the data to see if I could detect a trend. 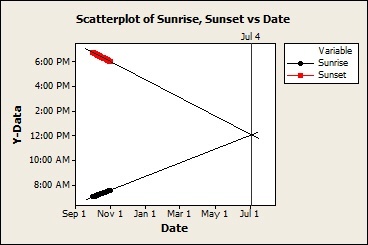 The scatterplot reveals, just as I suspected, that the sun is setting earlier and earlier each night. But that’s not all! Over the years, I’ve acquired a certain knack for detecting subtle trends that others often miss. It is to these highly tuned powers of observation that I attribute my most disturbing discovery. Not only is sunset coming earlier, but sunrise is coming later! When I discovered this, I wanted to turn away. I wanted to ignore what I had found and go back to watching political parodies on YouTube. But I felt a sense of duty, an overwhelming sense of responsibility to bring the world this news, grim though it may be. So I investigated further. I extended the x-axis on my scatterplot and used the line tool on the Graph Editing toolbar to project these fateful trends to their logical and necessary conclusion. My heart quickened, my eyes widened, a lump rose in my tightening throat as the ominous fate that this fateful scatterplot doth portend slowly dawned upon me. The trend lines sloped menacingly toward each other, slowly but inescapably drawing closer and closer, ever closer, until they finally converged on a single apocalyptic point. The meaning of this catastrophic confluence is clear enough. The end is nigh. I don’t know how else to interpret these data. When sunrise and sunset occur at the same time, it can only mean one thing: the last run, the final failure mode, the end of quality analysis--and life--as we know it. Just for the record, I’m not typically prone to apocalyptic asides. I have thus far in life managed to ignore the various cries from sandwich boards, pulpits, and blog posts proclaiming the ultimate doom. I did not have a large Y2K pantry, just a gallon of water and 2 tins of tuna (dolphin-safe albacore). Neither does it bother me that the “Hang It All” kiosk at my local shopping mall has stopped stocking Mayan calendars. (Funny story, I dated a Mayan back in the late 90’s. She believed that that 2-digit dates where proof that a civilization of ancient Cobol programmers knew that the world would end after 1999. She left me for the artist formerly known as Prince.) In this case, however, the data have spoken. We’re all doomed. I can’t believe it’s come to this. Who’s going to break the news to Al Gore? On the timeanddate.com web site, click the link, “Sunrise & Sunset.” Choose the nearest location, click “See sunrise/sunset,” and click “show” to show the whole month at once. Copy all of the values in the table (but not the headings). 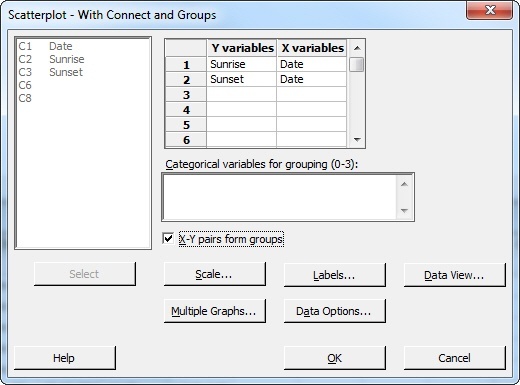 Paste them into a blank Minitab worksheet starting at row 1. (See below.) Name C1, C2, and C3, "Date", "Sunrise," and "Sunset" respectively. 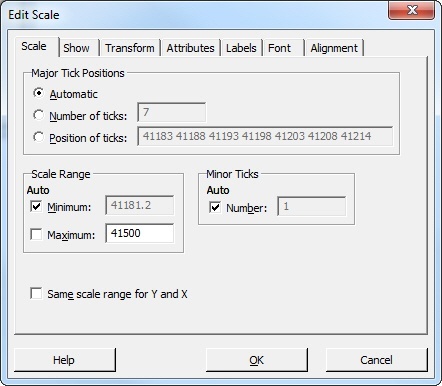 Change the date format so that the axis labels will not be too long. Click a cell in the Date column. 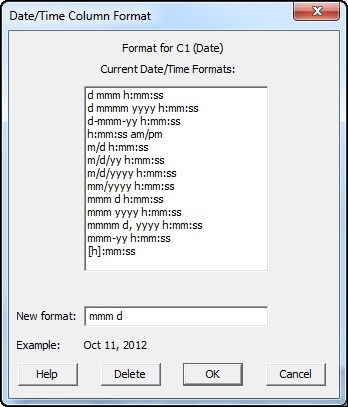 Right-Click and choose Format Column > Date/Time. In New format, type "mmm d", for 3-letter month and 1 or 2 digit day. Click OK.
Then click the line button on the Graph Editing toolbar and draw the trend lines. Lastly, add the vertical reference line. Simply right-click on the graph and choose Add > Reference line. Then enter the date that the world will end and viola, you are officially a doomsayer.